Well, we finally had our Valentine’s Day chocolate mousse and I thought that was what I was going to write about today. Until I saw a smoking gun this morning, in the form of the March school breakfast menu. Now, before I go any further, let me reiterate how much I love our elementary school. I adore it. I want to marry it. We’ve had nothing but fabulous teachers in every grade and have enjoyed every minute of the warm, welcoming community of learning it provides- no kidding. I wish I had gone to a school this good as a kid. In the past they have even done great things on the healthy food front such as plant a school garden and invite parents to contribute their favorite soup recipes for lunch. Currently there’s even a grant-funded healthy snack program that gives the kids fruits and vegetables in between meals. To look at it another way, I count a total of 30 possible options on the breakfast menu including condiments and syrup; out of those 30 items, 18 have added sugar… more than half. But it gets worse. 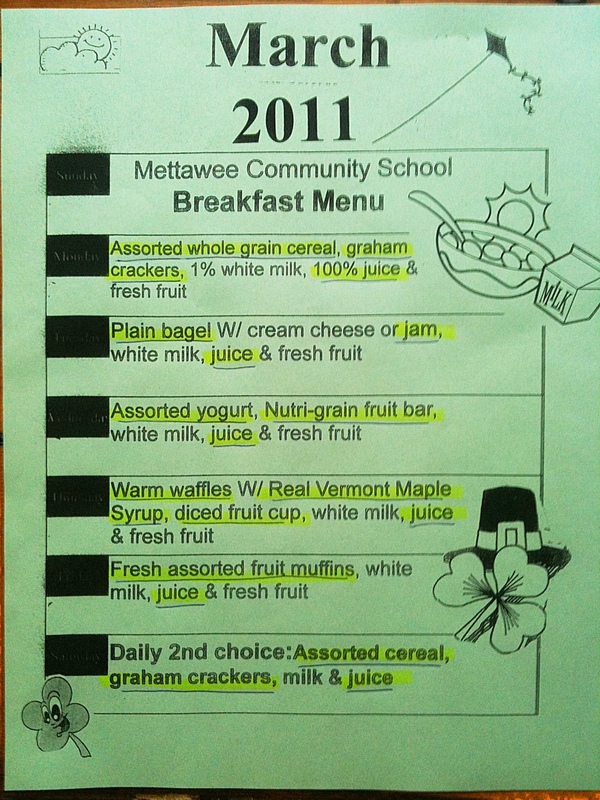 Looking closer, the school menu advertises “Milk Variety is Served with Every Meal!” What does this mean? This means chocolate milk. Okay, so if we assume a child chooses chocolate milk with his or her breakfast every morning, we are now up to 24 items out of 30 possible breakfast choices, or eighty percent of breakfast items containing added sugar. One more thing: every day children having breakfast are given a piece of fresh fruit. In fact, the fruit has fructose in it too- the only kind of fructose our kids should really be having if you follow the logic of pediatric endocrinologist Dr. Robert Lustig. Lustig’s contention, as I’ve mentioned, is that fructose acts as a poison in our bodies, (unlike glucose, dextrose, lactose, etc.) and that the preferable way to take in this “poison” is the way nature has neatly worked it out: by ingesting the “antidote” with it, which is to say the fiber and micronutrients found in the flesh and pulp of the fruit. This not only ensures we get the good stuff that outweighs the bad, but also that we consume the fructose in appropriately small amounts. So if we are looking at the number of items containing fructose (read: poison) in our breakfast menu for March 2011, and assuming a choice of chocolate milk every day? We can now bring our total of items containing sugar/fructose to 29 out of 30, or roughly 97 percent.What is the one item left not containing fructose? Cream cheese for our bagel on Tuesday. Now, my understanding is that the way the breakfast and lunch programs work in most public schools is that they are substantially subsidized by the USDA which lays out the nutritional guidelines and “approved brands.” The potentially good news is that over the last year first lady Michelle Obama has taken on nutrition-awareness in the nation, in which effort she is assisted by the white house chef Sam Kass, a huge proponent of local, fresh, and sustainable foods. This morning I came across a heartening article quoting Kass as being highly critical of the state of our school meals. Meanwhile, on the recent one year anniversary of her “Let’s Move” initiative, Michelle Obama posted a website message saying that over the last year there has been “a real shift in our national conversation.” Really? I’d like to think so- I really, really would. But so far my youngest still brings home all the wrappers from her school breakfasts that say otherwise. Now they want to make sure ALL the kids eat a sugary breakfast. They serve it at first period, IN THE CLASSROOM! My son eats a protein-packed breakfast at home, but he has trouble resisting the Pop-Tarts and juice available (for FREE!) in class. Pop Tarts aren’t served at our school, but the Frosted Flakes and Goldfish Grahams they do have are every bit as bad… How are kids supposed to resist being offered candy-food? I have to offer one correction here though: I’ve been informed the school used to offer chocolate milk at breakfast, but no longer. At Mettawee Community School chocolate milk is only offered at lunch- which at least shows that things might be moving in the right direction, if at a glacial pace. How about getting rid of chocolate milk from the school menu entirely? I mean, what’s the worst thing that could happen? You are currently reading A Year of No Sugar: Post 26 at Eve O. Schaub.